Like, I imagine, quite a few Paris expats, I used to pay a great deal of attention to the New York Times' Paris coverage before I moved here. After one settles in, the articles understandably begin to seem a little exoticist and ooh-la-la. Nevertheless I still thank that paper for pre-briefing me on 2ème cocktail bar Experimental Cocktail Club, where I can still be found far too often, and 5ème market-menu restaurant Les Itinéraires, where I had a fabulous dinner the day I got to Paris, the highlight of which meal was a positively haunting salad of shaved foraged mushrooms, tiny clams, and citrus vinaigrette. Suddenly there I was at Les Itinéraires again, two years in, enjoying some of the most astoundingly impressive wines I've had in years, thanks to Caroline, the rocking sommelier there, with whom I had in the meantime become friends. What can I say? I was in a delicate position, simultaneously wanting to explore Caroline's lengthy, gem-laden, largely natural list and give it the attention it deserves, and also to order something relatively acceptable to non-geek palates, of which there were to be three, at our table of four. Anyway, as we waited with our conservative Champagne, Caroline promptly upped the ante by pouring D and I a splash of 1èr cru Fixin. I didn't recognize the name of the estate - all I saw at that point was the word "Monopole," on the bottle, on the basis of which information I decided to let the wine sit and warm up a bit while I finished my other glass. 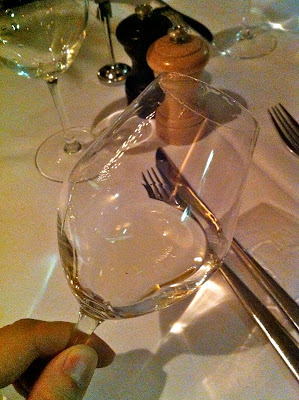 - and because the wine when it warmed up was astonishingly great. I devoured a plate of fussy but delicious scallop carpaccio and experienced that strange, profligate feeling one gets from sensing that one's artfully composed meal of delicacies is getting totally outshined by a glass of wine. 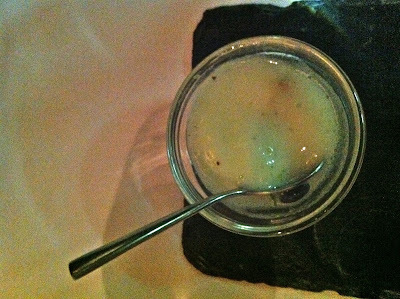 Sometime after the plats I broke away from conversation at the table to go seek more info on this mystery Fixin. 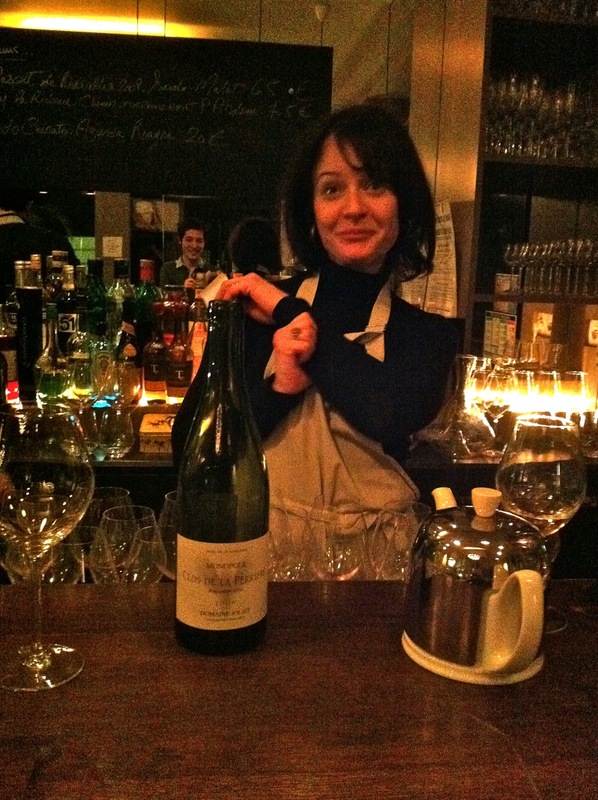 Caroline explained it was Domaine de la Perrière's "Clos de la Perrière" blanc, a sample bottle of a wine in such small production and such high demand she was unable to order it for the restaurant. 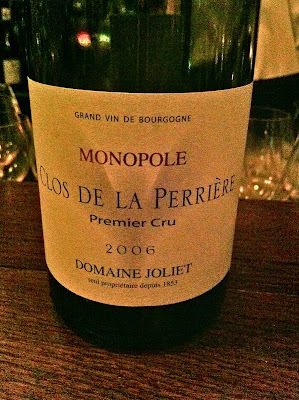 The estate is run by winemaker Bénigne Joliet, hence the seeming interchangeability between the names "Domaine de la Perrière" and "Domaine Joliet." Joliet is the 6th generation of his family to produce wine from the estate, which is among the most historied in all of Burgundy - the wines were previously considered to rank among the Grand Crus, until quality apparently declined in the 20th century. The articles I've read on the estate, linked below, all seem to share, and gloss over, the embedded implication that Clos de la Perrière's Grand Cru reputation began to decline at roughly the same time Joliet's ancestors took over the estate, 1853. This is impossible to confirm, of course, but it's an amusing hypothetical, especially since Bénigne Joliet is by all accounts hell-bent on reclaiming the reputation, and the prices, of Grand Cru burgundy for his wines. Perhaps because I was so focused on the wine, I kind of snoozed through the plat I ordered, a chunk of halibut that been deep fried - presumably in service of some unachieved molecular gastronomic goal - and plumped atop a truly hideous bedding of wilted cabbage and yet more foam, now derived from oysters. I might now digress for just a second to articulate the withering disdain I possess for most foams, jellies, hi-tech emulsions, meat tied into knots, etc. The rather overused term for these preparations is molecular gastronomy. With certain exceptions made for the most artful, subtle, graceful employment of them, however, I can't help but consider it all Contortionist Cuisine: technically very interesting, but vaguely wrong, and leaving one with the distinct impression that equal aesthetic enjoyment could be had without reaching quite so hard. Who knew that the mild, fence-posty nothing-flavor of raw turnip would provide such a beautifully refreshing counterpoint to the richness of dark chocolate, and the bite of raspberry vinegar? I didn't know that. Now I know that. It turned out she just hadn't reprinted the wine list in a little while. 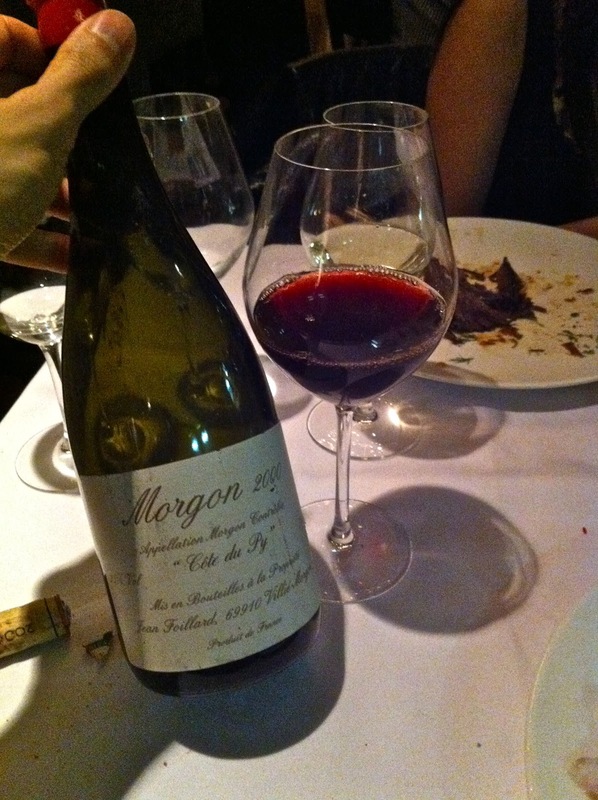 She had back vintages in reserve of many of the rocking great wines on her list, including Foillard's magnificent Morgon "Côtes du Py." Having just gone on about Foillard in a recent post about Le Chateaubriand, I'll skip the schpiel here, and report simply that the 2000 was in fine form: sharp, leathery, well-worn, with terrific fresh-earth and winter spice notes. I had some reservations about ordering a wine that I knew would be extremely savory in the company of non-wine-professionals, but was reassured by the reactions of my tablemates, who all seemed to dig it fine. The wine's long-distance runner excellence aside, there's also the dead-simple magic of cracking into older bottles, from which my professional experience in the wine industry does not entirely excuse me. Even as we note a wine's virtues or flaws, some part of us still exclaims, "My goodness! How time has passed!" * I was about to write "shaved Asian turnip" but the phrase just sounded really dirty and distracting.